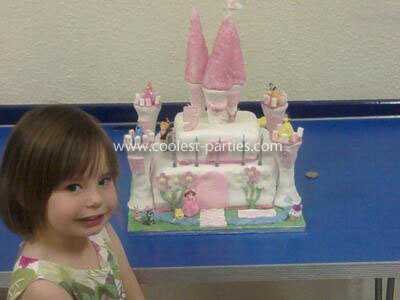 The idea for my nieces 5th birthday party all stemmed from the Disney Princess Castle Cake she wanted from a shop. The shop quoted £175 and I told my sister I could do one for her and make it more personal. My niece just loves the Disney Princess’s and has a lot of their merchandise including dressing up outfits. I apologise now because all the photos that a friend took on the day were lost when her camera broke… the only photo I have is my niece with her cake but I would still like to share the party pleasing ideas we used at the party. Tip No.1 – Get lots of people to take photos or your memories might be lost forever! First of all this was a birthday on a budget. My sister rented out the local community hall and we provided everything ourselves rather than pay over the odds for someone else to organise it all. We purchased the Disney Princess invites and these were given out at the Nursery and parents made aware of the theme. The children were encouraged to dress as a Princess or a Prince Charming or even a character from the well known Disney Princess films. My niece also brought all her dressing up outfits from the Princess range (all 6 of them!) just in case a parent couldn’t afford the dressing up and so no one was left out. We hired a bouncy castle to go in the gym hall and pretended this was the Princess’s Castle and this provided lots of entertainment as bouncy castle always do! They also had the use of the balls and other toys that were in the community hall and these were used whilst acting as little Princes and Princess’s. I set up a table to do mini makeovers which included bright eyeshadow colours, blusher, hair styling and nail painting. I have found that little girls playing princess’s love to look the part and have a little makeover and of course I was not wrong! They loved it! I just used my own makeup from the Barry M range as I have a lot of sparkly bright colours and it is also high quality and you only need a little! However you can purchase childrens make up from bigger toy stores and the Disney Princess range even stocks this. I used my babyliss curling wand to add some curls to the hair. We played pass the parcel. Each layer had a prize so no one was left out and it just took some careful planning of when the music stopped to ensure each child got a turn of ripping a layer off. My sister also cleverly decided on the winning order beforehand and wrapped the gifts according to boys and girls! So everyone was very happy! For serving food we purchased Pink disposable plates and Disney Princess napkins and pink cups. You can save money on buying the actual Disney plates and cups by just choosing pink shop brand. You get a lot more for your money this way and the children don’t even notice as long as they are pink! We covered the tables in pink disposable table covers and covered them in confetti for extra effect and decoration. For the food we made our own sandwiches, sausage rolls and bought cocktail sausages and some crisps. We even bought pink wafer biscuits to continue the pink theme and other pink sweets. The children were in awe of the Castle Cake I had made and were excited when it came time to light the cake and sing Happy Birthday. For the party boxes we included a slice of the cake, bubbles and a Disney Princess figure for the girls and a toy car for the boys. As there was lots of cake to go round it was given to the parents as well. We had wanted to play a version of pin the tail on the donkey but using a Disney princess poster which featured all the Princess’s but we just didn’t have enough time and couldn’t tear the children away from pretending they were locked in the Princess Castle waiting to be rescued by Prince Charming! We also only had the hall booked for a certain amount of time which in hindsight we would have booked for longer if we had known how successful the afternoon was going to be! So although we didn’t book a magical destination for the party or splash out lots of cash we were inventive and creative with the money we did spend and the games and activities we played.